Purchased for my spare bedroom. Color was as seen and the pillows are very nice. The only down side is the comforter is not as thick as I wanted. Redesign your bedroom with this sophisticated comforter set by Madison Park. Crafted from polyester, this set features a stunning charcoal and silver geometric design. This beautiful bedding set includes a comforter, bedskirt, shams and decorative pillows. Gorgeous & very contemporary, we loved it! I read mixed reviews about this item but anyway I ordered and I'm not regret at all. It looks very nice, it is true that it has some shimmer but is not terribly shiny and it looks so nice that I put that aside, the colors were perfect to us. It is exactly like the pictures they advertised. The only thing I did to make it looks exactly like those pics well I just used my steamer and voila! I had a very specific look in mind to go with newly purchased modern bedroom set. I read reviews and went back and forth for a couple weeks. The clincher was that several commented on how shiny it was. Exactly what I wanted plus the jacquard design was a complimentary design to the furniture. My room looks like it should be in a showroom and the comforter was the finishing touch. Extremley happy with this purchase!! Exactly what I was looking for. Ture to Description. I am going to buy an extra set for a back up. Was delivered quickly. The fabric has a shine to it and is not a cotton feel. 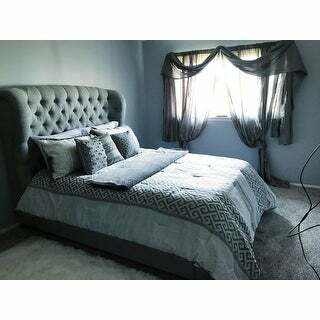 Came with 3 decorative pillows which adds a nice complete look to the comforter and pillow shams. I wish the set included euro shams so I could put bigger pillows in the back of the standard sized pillows with the shams. Luxurious look for a great price! I was surprised how wonderful this looks in our guest bedroom. Light and crisp silky fabric in neutral colors of gray white and very light gray with lovely throw pillows. You will not be disappointed! I have to return and try again because the comforter — the comforter is WAY too shiny for my Master Bedroom. I supposed it is a very beautiful set for a guest room. But for my Master Bedroom I wanted something with less polyester. I much prefer a Sateen Weave. However for the price this is a wonderful deal to fill up your guest and or spare room. The accessory pillows were very well constructed and beautiful. I would have bought those separately. Absolutely beautiful and the colors are perfect and as shown in the picture. I couldn't be more pleased with this purchase in my newly decorated bedroom. I would recommend this comforter set for someone looking for grey and silver in their decor. 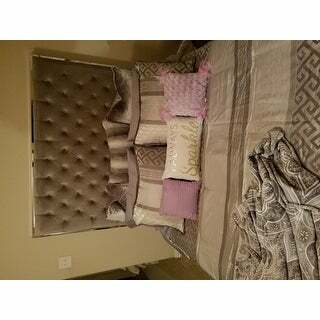 I purchased this comforter set for my master bedroom queen size bed. Absolutely love it! Very soft and warm. Sometimes almost too warm. The accent pillows are just enough to not mind replacing on the bed every morning. Reasonable price that provides an elegant touch....my kind of purchase. 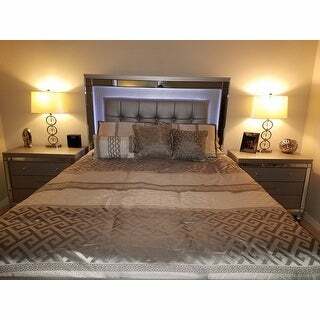 This set is a great quality and value, and matches all the decor in the guest bedroom. I love many of the Madison Park comforter sets. Thanks Overstock. Very luxurious and excellent quality. This comforter set is so chic! My daughter came by and asked, Mom where you find that. I told her Overstock.com. She's the one who started me from ordering from here. The comforter has a satiny gloss and everyone that sees it loves it. Only had it for a week but it is gorgeous. Only thing I hated about it was I had to press it and that was really hard but otherwise, I would definitely recommend it. This comforter set was not sewed well, there were a lot of puckers in the fabric and crocked seams. This comforter is exactly as it appears. The colors and fabric are great. The pillows are a perfect touch. Can't wait to add final touches to bedroom. Looks fantastic with in my bedroom. I like the style, but the fabric looks and feels cheap. The quality is reasonable given the price and looks ok when not up close. Nice. Would have been nicer for the comforter to be a little longer and wider. Dust ruffle could have been made a little better. It is very rich looking and soft and warm. Love the grey color. The only reason I didn't give 5 stars, is that it could be a little wider. It doesn't come down to the ends of the mattress to the bed skirt on the sides. The material is a little shiny, but I like it that way. "What is the headboard shown in the picture? Do you offer it for sale?" "What rug is displayed in the picture? " Unfortunately we don't have a any information on the rug. "Is this comforter slippery?loke all jacquard are?thanks"
It is Sort of slippery, being a silk type material. I do not sit on my bed with the comforter on it. "to order says taupe but description is grey and white?" It is grey and white. Very pretty. I am happy with my purchase. "This comforter indicates that it comes with a bedskirt. The bedskirt in the photo appears to be a velveteen gray fabric. Is that the same bedskirt that comes with this comforter set?" The bed skirt is a gray polyester fabric. I chose it because it looks nice and it should brighten up a small room. "Is the coverlet design printed on the fabric or is it a woven design (jacquard)?" This item has a jacquard woven pattern, not printed.